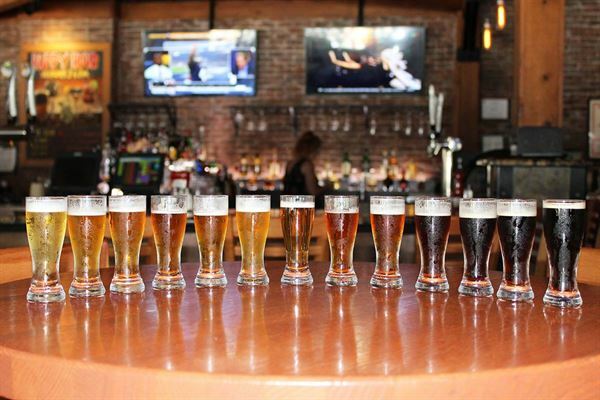 If you’re looking for a fantastic first impression and a satisfying lasting impression, come to Lazlo’s Brewery & Grill and experience something different – no pretense and no attitude. We practice the timeless art of hospitality where perfection is in the details. We listen and work with you to ensure that the service, menu, amenities and…well, everything about your party is better than you imagined. Small or large groups, business or personal, rowdy or refined, we’ve got a room that’s perfect for your gathering. Equipped with flat screen televisions, digital computer projectors, multimedia systems and wireless Internet access, our private dining rooms will accommodate your needs whether you are planning a demanding business meeting or fun-filled birthday party. Best of all, we never charge a room rental fee. Buffet Packages: • Heartland Deli | $14.19 per person • South of the Border | $19.19 per person • Backyard BBQ | $22.49 Custom Buffets: • 2 Entrees | $22.95 per person • 3 Entrees | $27.95 per person • 1 Entree + Prime Rib Carving Station | $26.69 per person • 2 Entrees + Prime Rib Carving Station | $31.79 per person Please see attached PDF for additional menu options. This spacious, yet inviting room is ideal for large groups looking for great cuisine and service in a unique environment. With plenty of room to spread out, the Brewery Room is ideal for family reunions, company parties and group presentations. This private setting offers the warmth of a fireplace framed by modern architecture that is wrapped in colors inspired by nature; this space is designed to promote a Zen-like experience. For smaller groups requesting a more intimate setting, choose to utilize one half of the Brewery Room, which we proudly call the Grain Room. Think of the Grain Room for family reunions, company parties or group presentations. Special Features: your choice of gas fireplace or flat screen television with satellite, VGA and audio inputs, sound system and CD/DVD player.